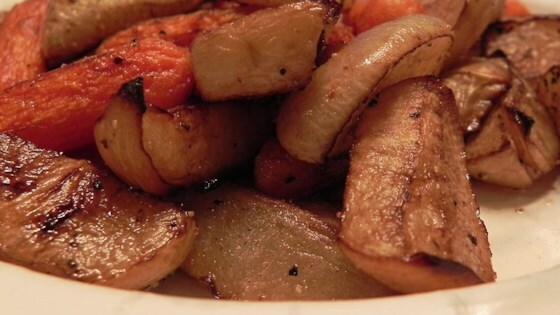 "I wanted to do something different as a vegetable side dish. It was Thanksgiving, so I got a bunch of root vegetables and roasted them. They were a hit and are now a staple at our holiday table. I cook them during the year sometimes, as well." Place the butternut squash, carrots, sweet potato, rutabaga, parsnips, and turnips into a large mixing bowl. Drizzle with olive oil, and toss to coat. Season to taste with kosher salt and pepper, and place the vegetables into a deep roasting pan. Roast in the preheated oven until the vegetables have lightly browned around the edges and are tender, about 45 minutes. Stir once as the vegetables roast to ensure even cooking. Roasting vegetables adds so much flavor. I add onions and garlic to these veggies and serve them over pasta. A little balsamic vinegar adds more flavor too. I made a few substitutions based on what I had (carrots, butternut squash, turnip and golden beet only). But the basic idea I think was the same and it came out delicious!